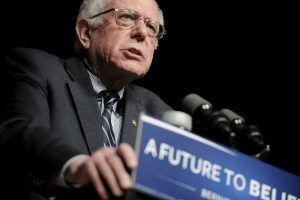 BURLINGTON, Vt. — People in this lakeside city that Bernie Sanders helped transform as mayor before embarking on a career in Congress are proud of the mark he’s left in the 2016 presidential race even as they recognize that his White House bid is almost certainly going to fall short. “What’s really cool is he sort of changed the narrative in a big way,” said Benjamin Gorback, 29, of Burlington, who works at the regional transit agency and was standing on Church Street in the rain Saturday with friend Vanessa Arbour, 26, an information technology worker. Both are Sanders supporters. Don Dresser, 65, a retired postmaster from Huntington who was wearing a “Bernie” sticker on his shirt, said he’s not sure what’s next for Sanders, but expects him to press his agenda at the party convention this summer.